Join us for a UTURN Resurrection Service. We get together every Sunday morning to worship, hear from God's Word and gather together in small groups. In those groups we pray for each other, discuss the teaching, and share what's happening our lives. UTURN is out to lend a helping hand. We will be preparing sack lunches and serving dinner for Bridge to Home. Space is limited. Deadline to sign up is April 28th. 5th-8th graders are staying overnight at church with epic games, a ridiculous amount of snacks, and the chance to stay up super late! Cost is FREE. Invite your friends! UTURN Guys are heading out for a late night of bowling! Cost for event is $15. Sign-up online by Thursday, April 4th. UTURN is heading to Winter Camp at Camp Cedar Crest! God has created each one of us on purpose and with purpose. He is calling us ALL to follow Jesus in living out our unique callings. It will be a powerful time on the mountain and we don’t want your teen to miss out. Early-bird registration rate is $190 and closes January 21st, then the price increases to $225. Siblings are 2 for $350, only through January 21st. 5th-8th graders are FUSE-ing together for an evening of fun. Join us at UTURN for games, basketball, spin art, a root beer float bar, and more! Free event. Sign up by Feb 20th. This week UTURN youth will be apart of the service in The Father’s House. What more does God have for us in the new year? UTURN will be celebrating and anticipating with baptisms during our Sunday services in The Father’s House. Start off your year by taking the next step in your relationship with Jesus and get baptized. Are ready to take the next step in your relationship with Jesus and get baptized. Sign up and pick up a Baptism Packet at the Resource Center or register online. UTURN will be celebrating Christmas with games, seasonal goodies, an Ugly Christmas Sweater contest, and a White Elephant Gift Exchange. 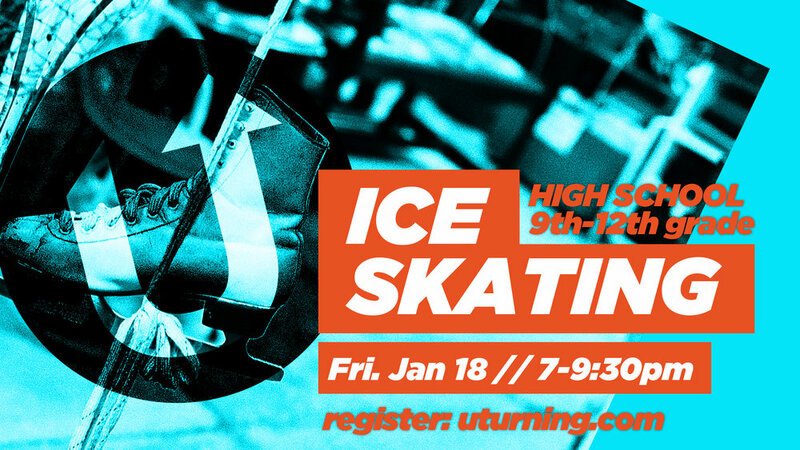 The 7th-12th grade guys will be taking over the UTURN building. Join us for epic midnight snacks and games. Inside jokes and fun nicknames are almost guaranteed! This is a free event. Register online.